- Please DO NOT press any buttons under water.Too much water contact will shorten watch life. - Each watch comes with 90 day 100% money back full refund guarantee.Any question about the product, please contact us, we will try our best to help you solve your problem. Multifunctional Digital Wrist Watches: Backlight with Afterglow, Dual Time, Dual Face, Daily Alarm, Lap Timer, Second Stopwatch, Auto Calendar, Shock Resistant, Pedometer, Waterproof. Perfect for sport and daily use. Men's Watch: Appeals to men, especially to those who like doing sport. Digital watch: Fashionable sporty dial design, military style outlook. Large Dial (1.97 inch) and numbers with light, show time clear in the dark. 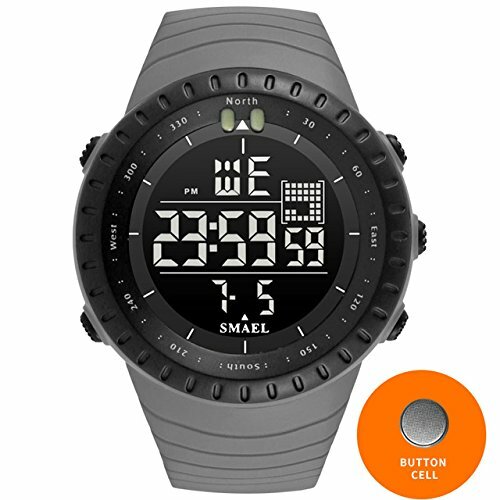 Sport watch: Shock resistant, perfect for both outdoor and indoor sports, such as running, climbing, fishing, football, etc.